Moving on down the ancient route to the Four Corners. One day I was on the star map and to my surprise found the connections to form the sacred grid I was sensing in the Four Corners of North America, this was a bit different though, as it included star systems. Mescalero Reservation and AUR1(star) falls in the center, Capella borders North and South Dakota of North America. The geographic center of America falls along its eastern line in the blue triangle. As you can see, this tetrahedron aligns with Pleiades/Taurus and Auriga....who has what? A pointed cap! In Greek mythology, Auriga is identified as the mythological Greek hero Erichthonius of Athens, the son of Hephaestus who was raised by the goddess Athena. According to the anonymous writer of the composition Catasterisimi, Erichthonius was generally credited to be the inventor of the quadriga, the four-horse chariot, which he used in the battle against the usurper Amphictyon, the event that made Erichthonius the king of Athens. Erichthonius then dedicated himself to Athena and soon after, Zeus raised the Athenian hero into the night sky in honor of his ingenuity and heroic deeds. Capella is associated with the mythological she-goat Amalthea, who breast fed Zeus. H.A. 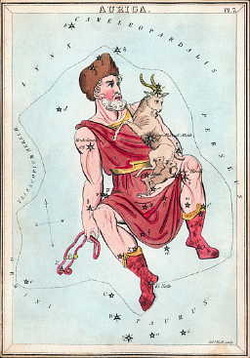 Rey has suggested an alternative way to connect the stars, which graphically shows the charioteer's head wearing a pointy cap and facing towards Perseus. This opposite tetrahedron falls in Central Asia, Tibet, India and extends east through Myanmar (Burma) into Vietnam. Hercules sword goes into Kazakhstan as mentioned in the opposite tetrahedron to Oregon...the Aral Sea Sacred Grid. His hand is extremely close to the Gulf of Aden where they say there is a stargate (yellow tac). The constellation name is Hercules, while the Greek hero is Heracles. Heracles was named after the greatest of Greek goddesses, Hera. Her name means "Lady" and she was the daughter of Cronus, and sister of Zeus (they were twins). Zeus later changed into a cuckoo and seduced his sister (he had that kind of reputation), and the two were married. Hera became the Queen of the Heavens: goddess of childbirth, marriage, and of women, she was the most widely beloved of goddesses in antiquity. It would only be natural that the greatest of Greek heroes would be named after her: Heracles means "the glory (or honour) of Hera". Although named after Hera, Heracles didn't have her immediate respect. Heracles was the son of Zeus and a mortal woman (Alcmene). Hera resented Zeus' philandering nature, and tried to have the child killed. She sent two monstrous snakes to his crib, but the infant strangled them both with his pudgy little hands. Heracles became a favourite with the gods. Apollo made his bow and arrows; Athena gave him a magnificent robe; Hermes provided him with a sword, and Castor (the greatest warrior) taught him how to use it. Hephaestus, the smithy of the gods, made a golden breastplate for Heracles. Thus armed and protected, Heracles paraded through Greek mythology, performing eight heroic deeds and the Twelve Labours. "Hercules" came to Italy in his tenth labour. He would later be given credit for abolishing human sacrifice in the land. The constellation was originally represented as a kneeling man.